This is a lovely, well-maintained home that has only had 2 owners since 1962. Several updates have been done but home is being sold "As Is." 1 Year Home Warranty being offered by seller. Great floorplan. 535 sq ft partially finished basement with small kitchen, separate patio and entrance. Gorgeous refinished hardwoods, newly painted, new carpet in den and basement, gas fireplace with built-in bookcases, new appliances. 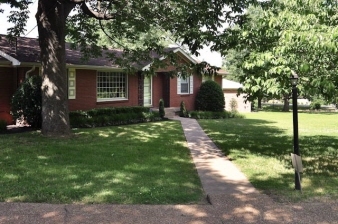 Beautiful all-brick ranch on acre lot with gorgeous mature trees. Lovely, quiet street in popular Oakland Acres Subdivision. Great location--only minutes from Ellington Pkwy, Briley Pkwy, I-65, Inglewood, East Nashville and Downtown Nashville.